I'm looking for the title of a book that I read sometime in 2004-05. What I remember about the book is that it focuses on a group of teenagers who live in a fantasy type world with monsters, mages, and knights. However, when they sleep in this fantasy world they wake up back in the real world, even though they hadn't been sleeping in the real world they just immediately remember what they are doing and why they are doing it. I'm quite sure the book I had read was part of a series. I do remember one scene from it where the characters fall asleep in a barn and the main character "wakes up" in the middle of a grocery store with a list from his mother of what to pick up. He then goes about his normal life for a bit before being woken up back in the fantasy word by his friend as they're being surrounded by an enemy. The main character reaches for his axe but fumbles with it. I hope thats enough detail. I'd love to find and read this series again. This reminds me of the "Everworld" series, by K.A. Applegate. There are 12 books, which were published from 1999-2001, so any of the series might be available in 2004. The cover art might be helpful in picking out which book you encountered. The series centers around a handful of teenagers, four or five of them. These teenagers travel to a fantasy world in the first book, four of them looking for the fifth (who was taken there forcibly). The fantasy world includes monsters and creatures of all kinds, various pantheons of gods and their worshipers (including Greek, Norse, Egyption, Celtic, Aztec, and others), and mythological beings like fairies, dwarves, merpeople, etc. There are knights and other warriors, and also mages, since magic is a thing in this world. One of the plot points that I recall quite clearly is that after some time, they "wake up" into the real world, and find doubles of themselves have been living their normal lives while they were away in fantasy land. These versions share memories, so everything they learn or experience gets shared by both versions - they will know about whatever situation is happening when they wake, since the version of themselves they're joining already knows about it (I think the transfer of memories does disorient them a little, but once they know what's happening they can hide it). 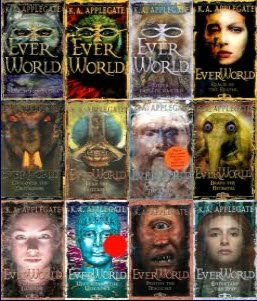 So it is very likely that the character might fall asleep in Everworld, wake up in the real one with enough context to run errands, and be woken back to Everworld when needed there - I don't specifically recall the grocery list and axe setup, but I read them years ago. It was also possible for them to research some information while awake (like mythology, or survival skills) and pass it on the the fantasy-world versions when the fantasy versions sleep again.